The International Student Barometer is a global survey of international students which was conducted in October – November 2015. ISB is one of the best tools students can use to make their voice heard and inform universities on how they’re doing. UEL collected and analysed the results in detail and the data was then disseminated to all Schools and Services to help improve the international student experience for existing and future UEL students. UEL achieved a response rate of 52% and an overall satisfaction score of 83.4%. ISB named UEL number 1 in Million+ and number 1 in London for sports facilities. UEL was also ranked 1st in the UK and London for health and wellbeing support and 1st In London for faith provision. To add to this, UEL was ranked 6th in the UK and 1st in the Million+ group for its welcome for international students and 1st in the Million+ group for its library facilities and other learning facilities. All in all not too bad, right? “ISB is very important because it tells the university how they can improve and it gives other international students a scale on approximately how good the university is for international students. We all need to speak up so the university can hear our voice because it gets lost along the way at lot of the times,” says Carter Richardson, the winner of this year survey. Carter, 3rd year Pharmacology student from a small town in Missouri, is really enjoying his experience at UEL. The fact that Stratford Library was built on Carter’s first year as a result of a series of campaigns and surveys that people were filling out encouraged him to take part in the survey. 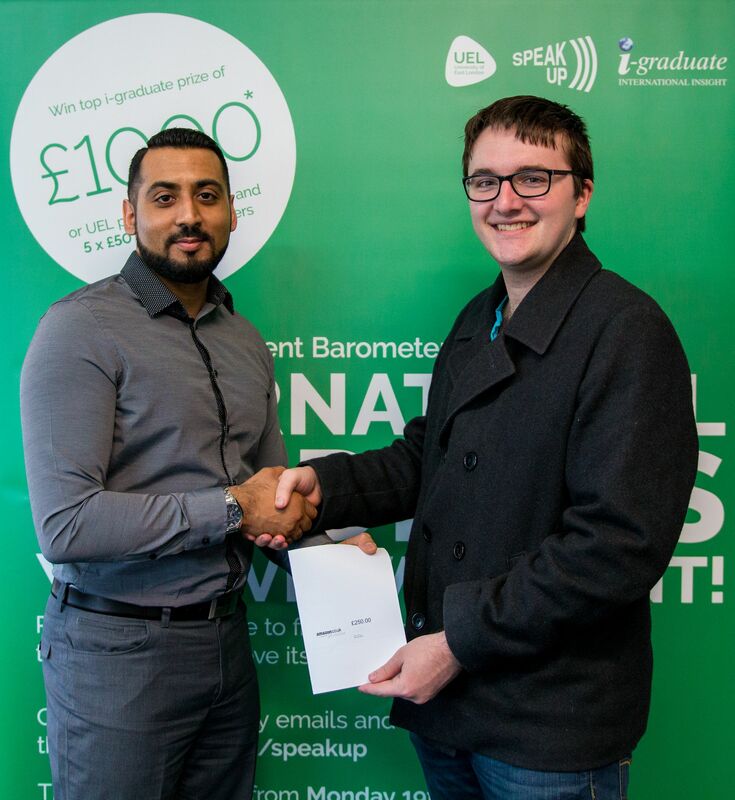 When Carter signed into his UEL Direct and saw the ad popping up he just took the opportunity, without even thinking about the chance to win £250 Amazon voucher.